This is, so far, the safest place from napping cats that I can find. Oh my, I can’t wait to see this come together. It is going to be really hard not to work on it day and night – but this is my busy week at work (and I’m actually at work right now on a Saturday). But… I’m sure a few minutes tonight to see it get started won’t hurt! Maybe I’ll see you again tomorrow with an update! 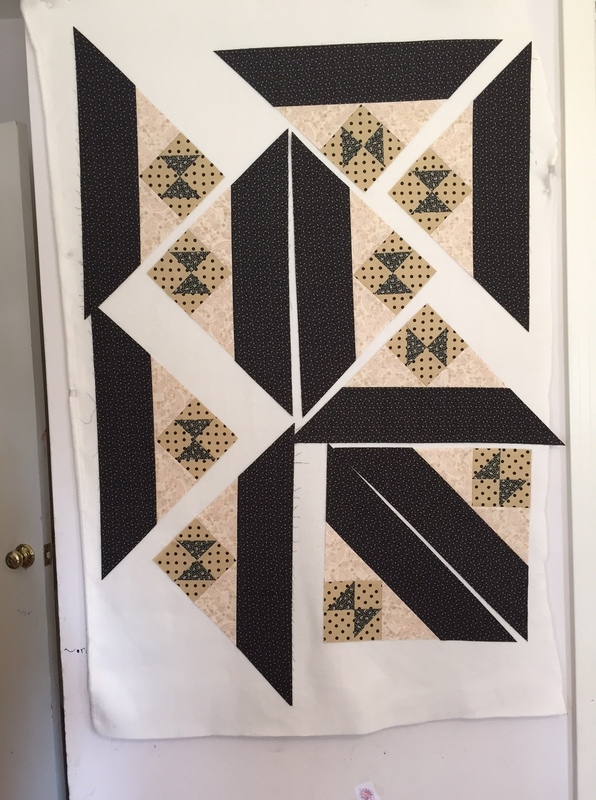 All 14 blocks for Reach for the Stars is done! 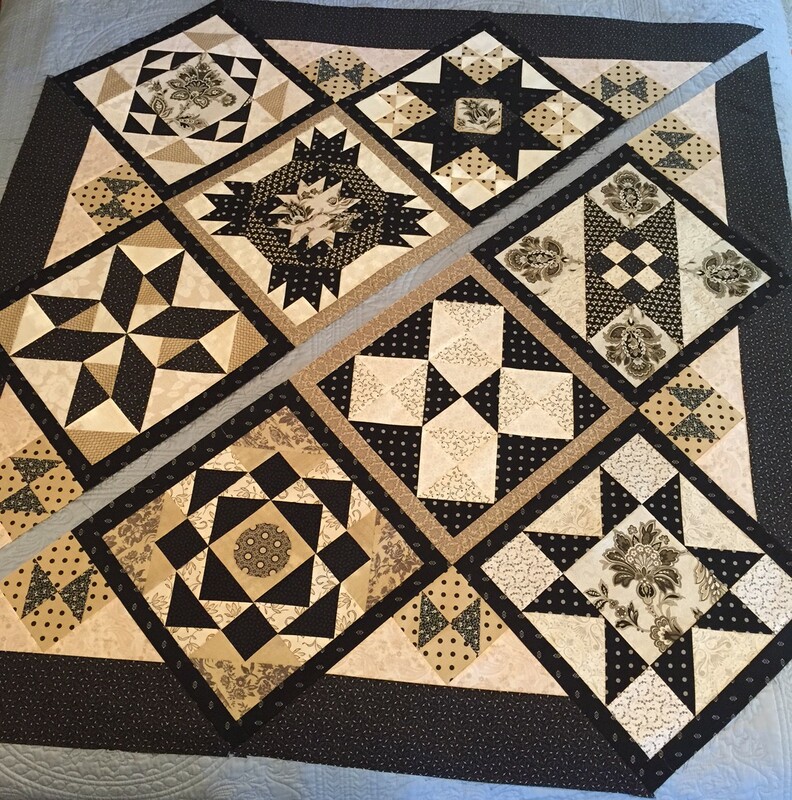 I picked apart and reconstructed Block 12. Much lighter feel to it. Love it now. And, drum roll …, Block 13 was completed today! 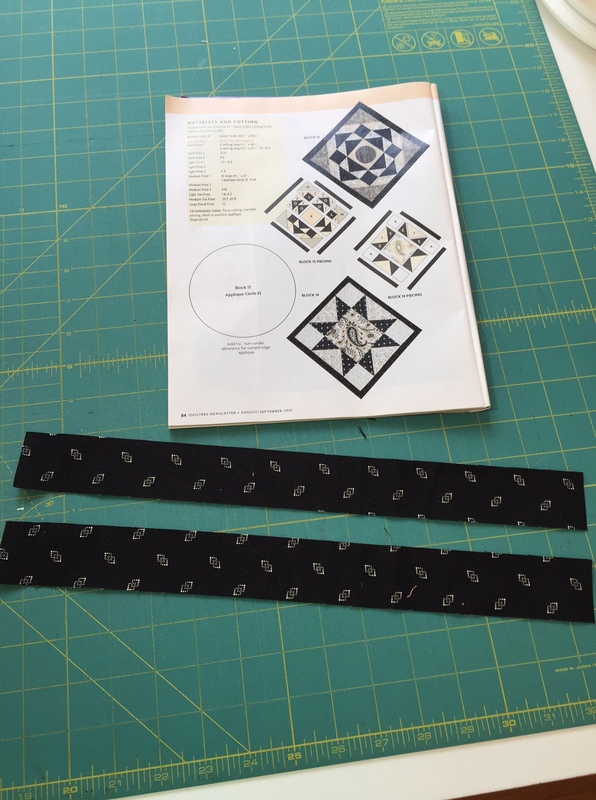 I even followed the directions for some of the pieces that were in 1/8 cuts, but it came out easier than I expected. 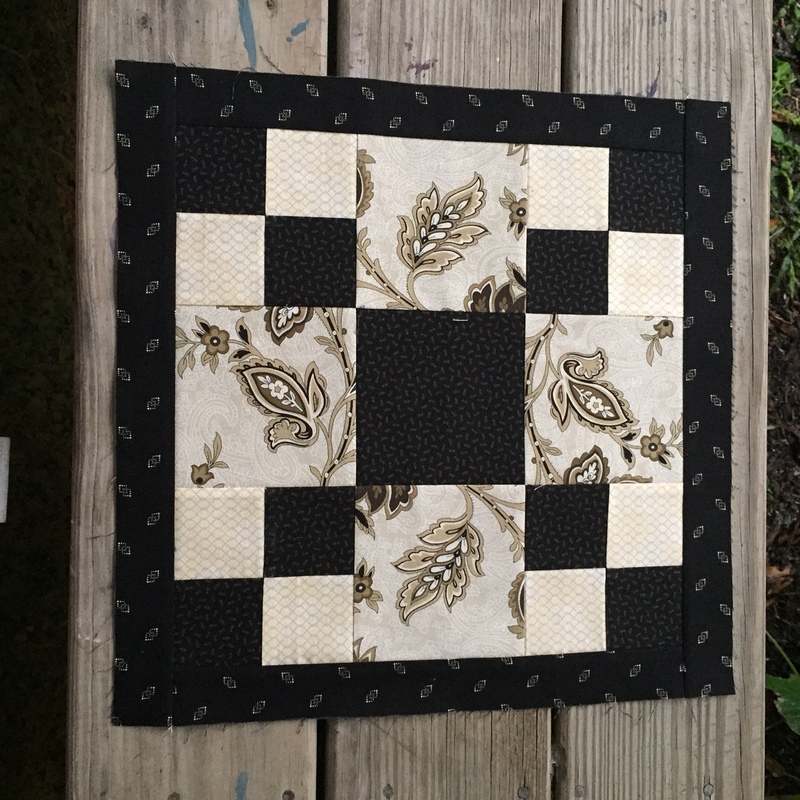 I used the Fit to be Geese ruler by Open Gate Quilts for my flying geese units. Perfect every time. 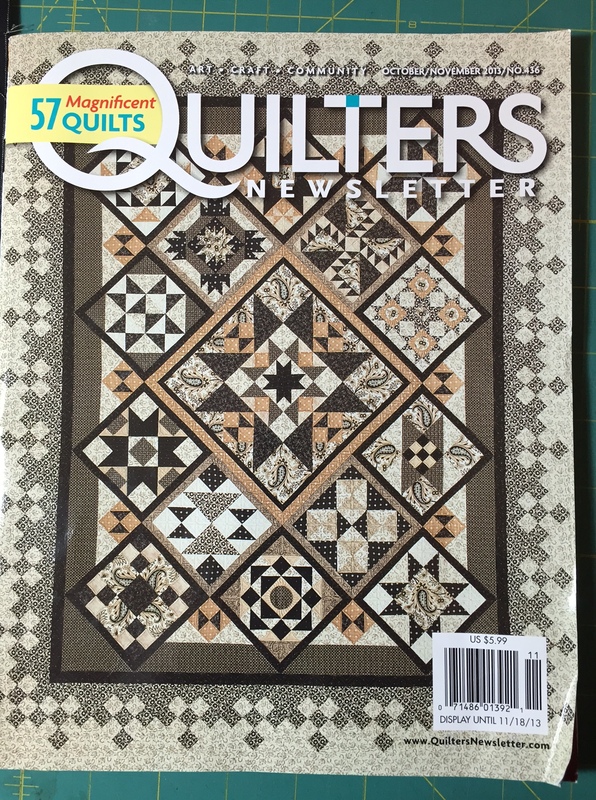 As a reminder, here is a picture of the cover quilt, designed and pieced by Terri Krysan and published in Quilters Newsletter magazine from Oct/Nov 2013 to Oct/Nov 2014. 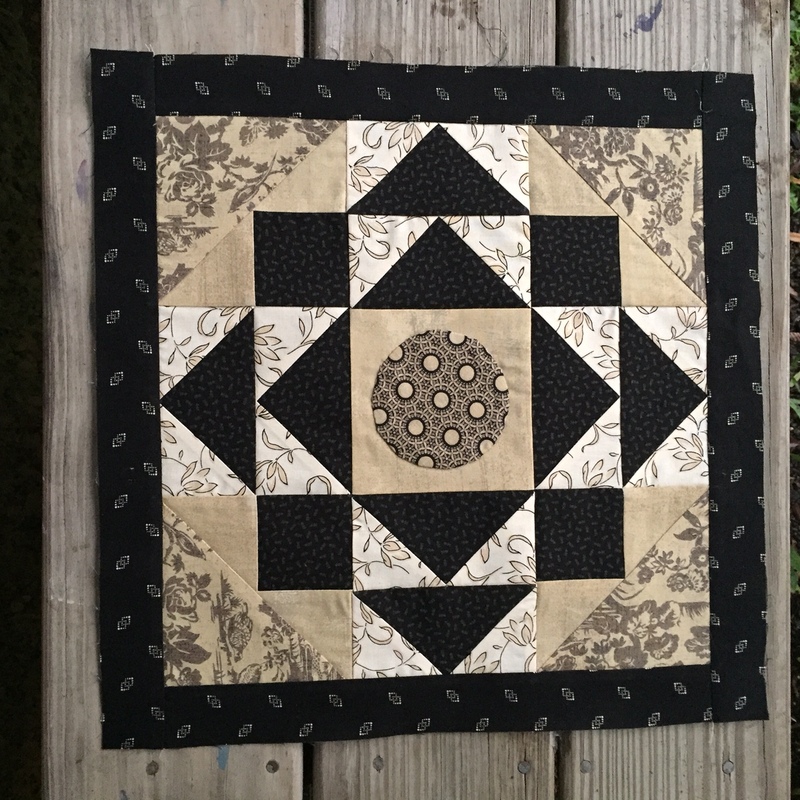 I have the center medallion and the 14 surrounding blocks done now. 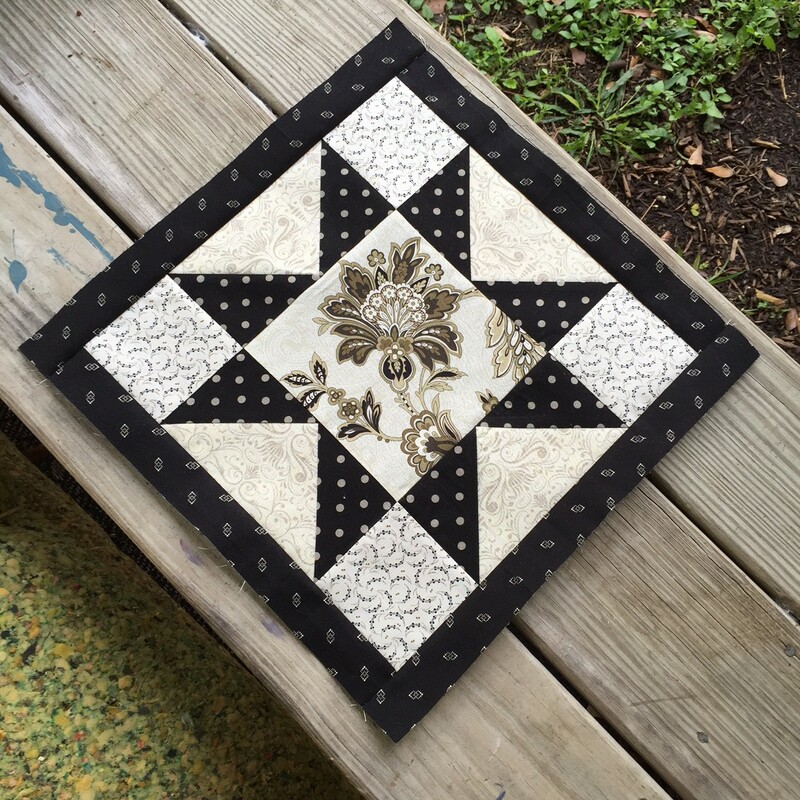 But if you have made a quilt or two, you know as well as I do that I may not even be halfway through the work yet. 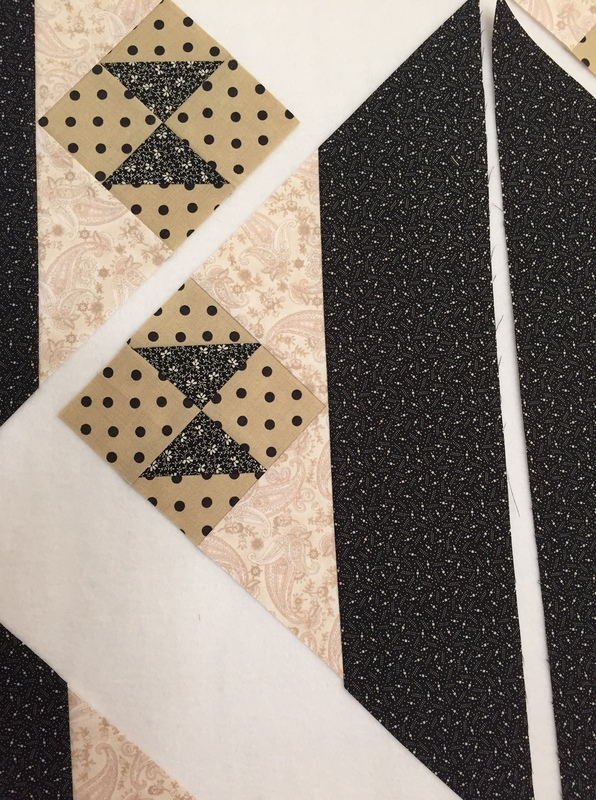 Those setting triangles, inner border and especially that pieced outer border will likely take as much time as the blocks did. Better get started! 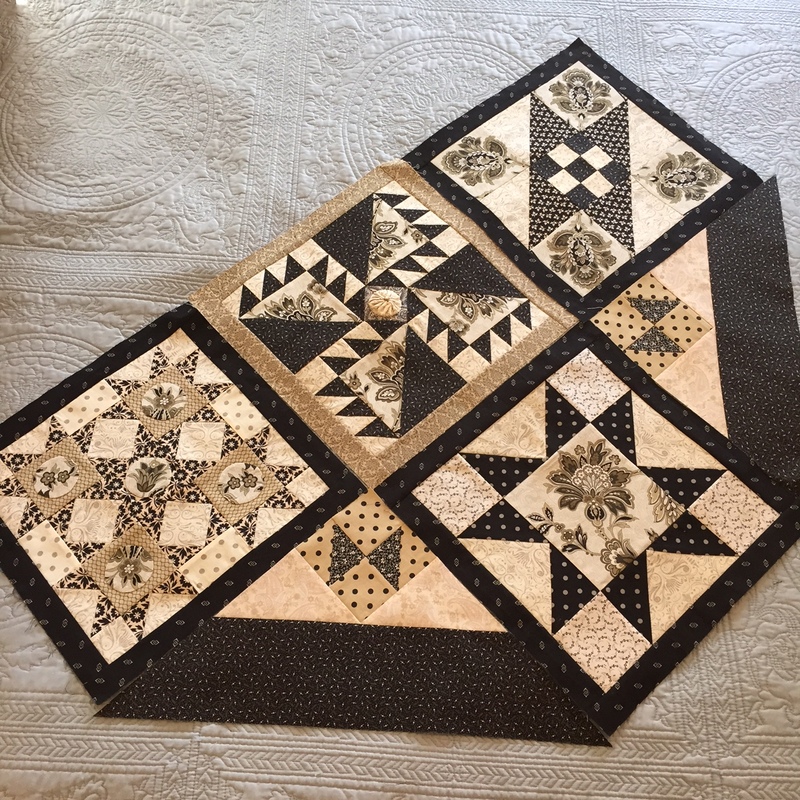 If you would like to see an exemplary completed version of Reach for the Stars – you MUST visit Dawn’s blog at First Light Designs. 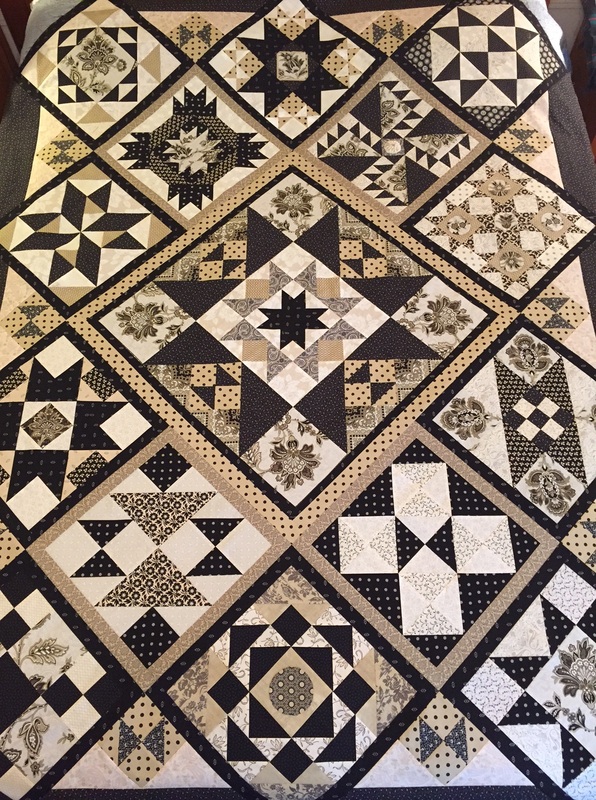 She not only got her quilt top done before the end of last year, she has already gotten it back from her quilter and it is spectacular! Dawn went with some cool tones of blue and green with black accents and it really makes the blocks pop out. You can click HERE to visit her post from Jan 4th and see all her pictures. 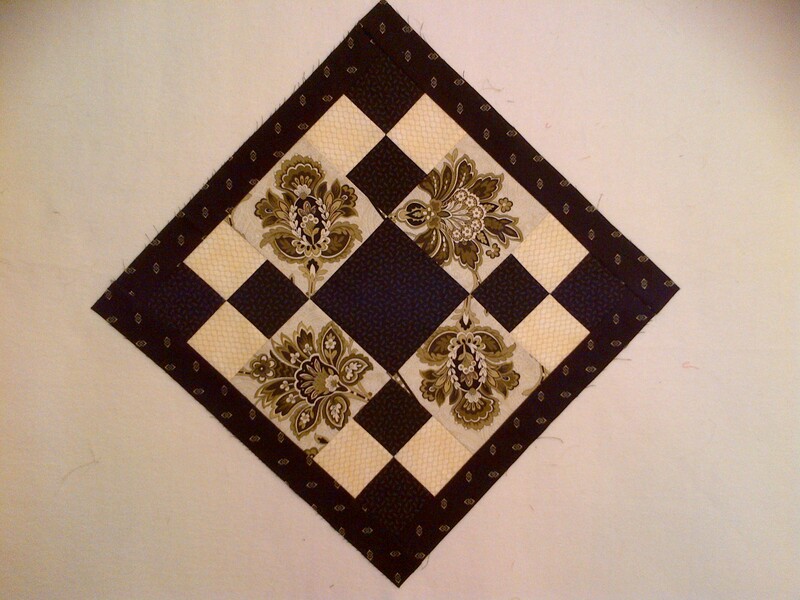 I’m still doing well on a little quilting activity every day, even if it is 5 minutes to look at fabric choices. I’ve gone a week without buying any new fabric, so that’s a real accomplishment for me. Fortunately, I was already enrolled in some BOM programs, so a squishy package comes to my door anyway a few times a month. Hope you are having a snuggly weekend. We have watched TV, eaten pizza and tried to stay warm inside.